The pillars of commerce—trade and finance—now seem like lost relics in an archaeological dig. To carry the metaphor to its ultimate chokehold, the world of business has been subsumed by the lava of the mortgage and derivative eruptions; now, the field has swelled with the Louis Leakeys of the academy and newsprint. They burrow into economic caves, find a shard of collateralized debt obligation, and chew over a hieroglyphic handed down from Greenspan or Keynes. To his credit, Dani Rodrik doesn’t back away from this question in The Globalization Paradox: Democracy and the Future of the World Economy. In fact, it’s where the book hits its stride as he dissects the foxes and hedgehogs of the profession. An honest practitioner of the profession, Mr. Rodrik writes, should respond “with a blank stare” when asked what the implications of his work are for policy. “That depends on so many other things,” would be the honest response. Instead, we get doctrinaires like Summers, Reich, and Laffer pushing their own particular brands of economic policy. Mr. Rodrik is on to something here. Like Henry Petroski for engineering, he is happy to look with a clear eye at the foibles of his profession and how it stumbles and adapts outside the confines of the classroom. Beyond his insight into the practice of economics, Mr. Rodrik takes on the most sacred of cows. His premise is contrary to everything you’ve heard from the “one world” types who nibble cheese at Davos and opine how trade globalization promises to give everyone access to markets and capital and be the perfect engine for saving the underdeveloped regions. Yet, the last two centuries of globalization have produced huge economic gulfs between nations. How can that be? Has there been too little or too much globalization? Neither, according to Mr. Rodrik. He waves off both the “earth is flat” advocates and the trade protectionists, arguing it is impossible to successfully pursue democracy, national determination, and economic globalization all at the same time. At best, he avers, we can pick two of the three. 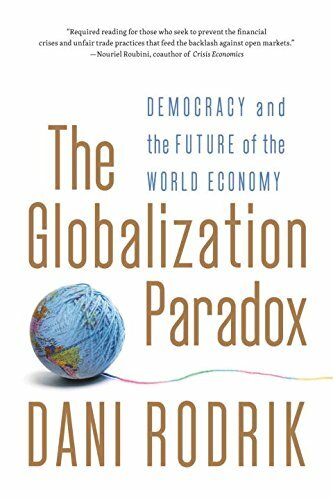 Mr. Rodrik goes for democracy and national determination trumping hyperglobalization; democracies have the right to protect their social structures, which trumps the requirements of the global economy. Rather, a thin veneer of international rules that leaves substantial wiggle room for nations, he believes, is a better way to globalize. As provocative, Mr. Rodrik makes the case that less trade is often better than more, and that any analogies with “progress” can be misleading. In that sense, American trade unions’ suspicions about the threat globalization poses to their members’ jobs is well founded as whole industries have been shipped overseas. And it’s not just blue-collar work that’s been exported: Of IBM’s nearly 400,000 employees, an eye-popping 130,000 are in India—making Big Blue the second-largest employer there, not exactly something it is anxious to publicize in the U.S.
Mr. Rodrik is exactly what the doctor ordered because economics over the past few years has become hyper-politicized (thank you, Paul Krugman) yet never more dismal. Well-written, witty, crafted by an author who doesn't jump the “Freakonomics” shark, The Globalization Paradox reminds us that economists don't exist without data, and data comes, ultimately, from the vision and labor of those in the marketplace. I won’t spoil things by revealing the answer, but one of the world’s foremost economic development experts was in Mr. Rodrik’s classroom when the question was posed—and got it wrong. These days, unfortunately, it seems the media and publishing worlds revere the people digging through the economic rubble, hoping to tell us what happened and predict (never correctly) the future. Enough already. How about moving away from the financiers’ Dead Sea Scrolls and instead studying the prophets—the entrepreneurs, that is—who are trying to rebuild the economy instead of skimming it?